A new Council for Ascension Island has today been announced by Returning Officer Dean Hambleton-Ayling, following an Island-wide election on Thursday 1 September 2016. Today Governor Lisa Phillips congratulated those elected to serve on the Ascension Island Council and noted the encouraging 80% female representation. In total, 121 people cast valid votes. This represents approximately 23% of those eligible to vote – compared with 35% in 2013. The Ascension Island Council met for the first time today, Friday 2 September, at 1pm, when Members Keturah George, Marie-Anne Dennis, Jacqueline Ellick and Samantha Arms-Lawrence took the Oaths of Office. Nicholas John will take the prescribed Oaths when he returns from overseas leave. 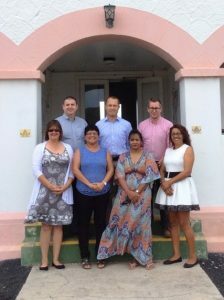 A photo of the new Ascension Island Council is attached to this press release.